For all us nerds out there who wear glasses, the recent 3D movie craze came and went without leaving a dent. That's because most 3D glasses don't fit well over the ones we need every day. That's been my main concern with the virtual reality devices coming soon to a game console near you. Those wraparound spectacles look impressive, but can a nearsighted geezer like me even appreciate the elaborate visions within? The Oculus Rift and Sony's Project Morpheus have come a long way in that regard over the last year. Both devices leave plenty of room around the eyes, and I was still able to adjust their displays enough so that their images came in sharp focus. Oculus CEO Brendan Iribe sympathizes with my complaint. He says the company's core founders wear glasses, and they spent a lot of time on the architecture to ensure such players were comfortable. There is another group that may have trouble with virtual reality: people who are prone to motion sickness. I'm not, but I felt a little dizzy after playing one 3D shooting game on the Morpheus. I didn't experience any such wooziness with the games on Oculus. "Motion sickness is an issue," Iribe says. "But the Oculus Rift won't ship until it's comfortable for sensitive people." 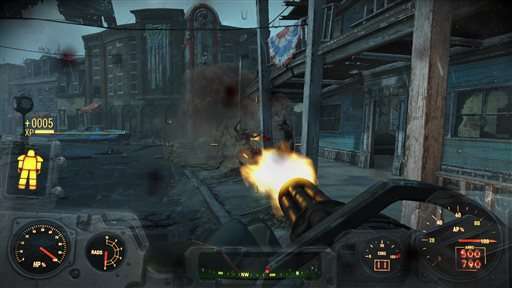 The existence of Bethesda Softworks' "Fallout 4" didn't come as much of a surprise. After the huge success of 2008's "Fallout 3," everyone assumed a sequel was inevitable. What did floor the crowd at E3 was the announcement that "Fallout 4" was coming in November—severely truncating the multiyear cycle of announcement-hype-release that typically accompanies a potential blockbuster. Square Enix pulled a similar fast one with its reveal of a new "Hitman" game for consoles and PC. That one will be out in December. In either case, it's the video-game equivalent of Beyonce dropping an entire album on iTunes without any advance word. Will the day come when we first hear about a big game and can download it the same day? Probably. Meanwhile, Bethesda did announce a companion iPhone app, "Fallout Shelter," that fans could download and play hours later. On the other hand, there's "The Last Guardian," which Sony revealed in 2009. It finally resurfaced at this year's E3—but it won't come out until 2016. The reappearance of "The Last Guardian" delighted fans of its director, Fumito Ueda, who created the cult classics "Ico" and "Shadow of the Colossus." But there was still plenty of chatter at E3 and online about some of the games that didn't show up in LA. — Nintendo made it clear in April that it wouldn't be showing the latest chapter of "The Legend of Zelda" at E3, but its absence still had many speculating that it won't come to the struggling Wii U at all—and we'll have to wait for Nintendo's next console. — Microsoft left two high-profile titles—the hyperpowered shooter "Crackdown" and the time-warping adventure "Quantum Break"—out of its E3 presentation. But Microsoft swears both games will show up later this year at Germany's Gamescom convention. — Things don't look good for fans of the portable PlayStation Vita, which Sony mentioned only glancingly in its E3 showcase. It smells like toast. — And then there's "Beyond Good & Evil 2," the imaginary sequel to a beloved 2003 game. Ubisoft first revealed plans for a follow-up in 2008, but it's been years since we've heard anything about it. Every E3 that passes without "BG&E2" breaks our hearts a little more.